Listen to "Alex & Me: How a Scientist and a Parrot Uncovered a Hidden World of Animal Intelligence--And Formed a Deep Bond in the Proces" on your iOS and Android device. On September 6, 2007, an African Grey parrot named Alex died prematurely at age thirty-one. His last words to his owner, Irene Pepperberg, were "You be good. I love you." What would normally be a quiet, very private event was, in Alex's case, headline news. Over the thirty years they had worked together, Alex and Irene had become famous two pioneers who opened an unprecedented window into the hidden yet vast world of animal minds. Alex's brain was the size of a shelled walnut, and when Irene and Alex first met, birds were not believed to possess any potential for language, consciousness, or anything remotely comparable to human intelligence. Yet, over the years, Alex proved many things. He could add. He could sound out words. He understood concepts like bigger, smaller, more, fewer, and none. He was capable of thought and intention. Together, Alex and Irene uncovered a startling reality: We live in a world populated by thinking, conscious creatures. The fame that resulted was extraordinary. Yet there was a side to their relationship that never made the papers. They were emotionally connected to one another. They shared a deep bond far beyond science. Alex missed Irene when she was away. He was jealous when she paid attention to other parrots, or even people. He liked to show her who was boss. He loved to dance. He sometimes became bored by the repetition of his tests, and played jokes on her. Sometimes they sniped at each other. Yet nearly every day, they each said, "I love you." Alex and Irene stayed together through thick and thin despite sneers from experts, extraordinary financial sacrifices, and a nomadic existence from one university to another. The story of their thirty-year adventure is equally a landmark of scientific achievement and of an unforgettable human-animal bond. 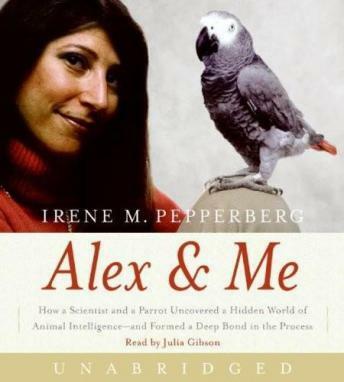 Irene Pepperberg is a brilliant scientist who provides empirical data that Alex is one brainy bird. Their fascinating story is engaging, eye-opening and inspiring. After reading/listening, you will never again insult parrots and other fine feathered friends by referring to stupid people as bird brains.